Applications design for extremely quote, rugged, high performs,3.0-12.0TB and 12 hot-swap drives high-performance single to dual 8Gb/s fiber channel hardware RAID controller on desktop space with Operating Systems support LINUX, MS WIN, OS X, SOLARIS and VMWARE, KVM, Xen for cloud computing storage. • Drive capacities 10K RPM 900GB, 1TB 7200RPM. Secure drive technology with high G-Force 600GB SAS 15,000RPM and SOLID STATE DRIVE (SSD). • LED drive states and accesses options. The Nomadic 1U 12xPro array provides a compact and affordable, storage solution that's simple to deploy and easy to manage. Designed to support growing storage requirements, the high-density array scales to meet your business needs, and its building-block approach reduces costs and simplifies future upgrades to enterprise SAN, NAS, iSCSI solution. 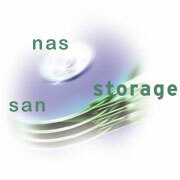 The integrated solution that deliver both Fibre and iSCSI interface option to same storage with simple management tools, without the need for proprietary SAN licence requirement, all SAN volumes are also shard over iSCSI gigabit network as well as high speed 10GBT I/O option to maximize the storage speed for cloud network. As you build your storage requirement you can simple add 12TB module as needed bases simple grow the storage via SAS expansion or, Fibre, iSCSI or 10GBT or for cloud, with less than $0.60/GB. Finally a product that doesn't require a refrigeration to keep it cool, with complete environment factor of low power, noise and light material, it ideal design to be keep on desk side or studio, the Nomadic 1U 12xPro. with the 4480c Controller Technology which offer the SAS expansion port option your able to expand the storage requirement to a enterprise level to 250 drive bay so you can buy the storage capacity you need today and be able to quickly and non-disruptively add mixed drive capacity as you grow. The built-in controllers browser-based management tool simplifies the management of your SAN and is an ideal way to expand your storage needs. With dual 4Gb/s connectivity up to four 4Gb/s, exceptional data availability, reliability, and the flexibility you need as your storage grows from 12TB in single 1U rack space, the Nomadic 1U 12xPro offers an elite storage solution at an entry-level price. The array is easy to deploy, with flexible configuration and management options, online capacity expansion, and remote monitoring. A single GUI network interface provides common storage management across all arrays in the Nomadic 1U 12xPro Family, reducing the number of elements you need to manage. In data intensive environments, increasing the capacity per disc drive lowers ownership costs by deploying fewer systems that use less cubic feet of space requiring less infrastructure such as cabinets, HBAs, and less wattage of power. The Nomadic 1U 12xPro uses 7.2K RPM high-performance 2.5" drive capacity with SATAII and SAS drive bay. Users who have the need for extreme speed to reach over 5.8Gbit/sec for RAW 2K, 4K film resolutions, or 1080p 60 frame, virtually eliminating the need for costly SAN solution for enterprise level product support.